Image Courtesy of a meme generator (most likely). 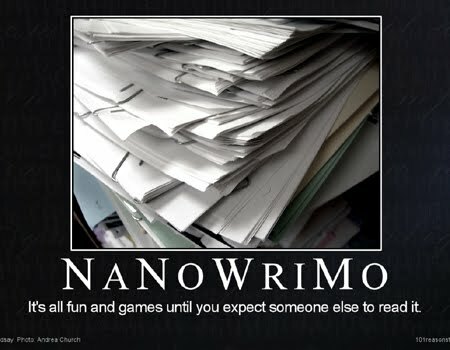 Hello fellow writers, readers, readers of writers and NaNoWriMo enthusiasts! That’s the big thing, yes the whopper of a challenge, a commitment like no other (though there are ones that match it – Movember anyone?). Yes, it’s November and that can only mean: National Novel Writing Month. Does it make you weak at the knees? Shake with fear? Or celebrate with a plethora of plosives, fricatives and oxymorons? However you feel about it, don’t worry as you’re not alone. I have continuously thought about entering, but unfortunately I have never followed this through. And I always make up excuses! My problem is I really dislike the premise of failure, but one year I’ll say screw it, this is it, this is when I make the commitment. Hopefully that year for you is 2012 and if it is, we’d love to hear from you. Is it your first year? Are you a regular? Why have you made the commitment this year, in particular? Whatever your thoughts are, be sure to post them below or contact us here or via our email creativewritinginkwell@hotmail dot com. In addition, but with no more terrible pop culture references, Inkblots has three more Half Hour Challenges to post up and a couple of other surprises, so keep your eyes peeled.